The PURE Fractional Skin Resurfacing and Tightening treatment combines two Rejuvenation methods simultaneously to not only target lines and wrinkles but also skin texture and tone. It uses the same, unique EndyMed technology as the GLOW Tightening & Lifting Treatment, 3DEEP Skin Science, but delivers it in a different way, focusing the radiofrequency in the top layers of your skin. 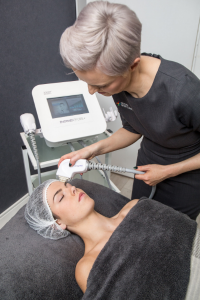 The radiofrequency generates the optimum level of heat to stimulate your skin cells and encourage new collagen to be produced, which in turn improves the underlying structures of your skin, causing it to tighten and smooth. At the same time the top level of skin, the epidermis, is removed in microdots as intense but rapid heat spots are created. Although the microdots are difficult to see, they stimulate the natural healing response as new, fresh skin is formed and the surrounding tissue is also renewed, softening and brightening the skin. 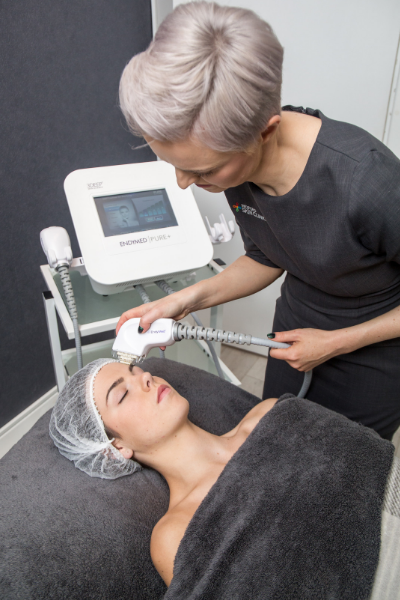 Because the treatment stimulates natural responses in your skin it can take a little time for the full effects of the treatment to show, but you can see improvements within a few weeks, with the best results from three months onwards after the treatment course. EndyMed PURE Fractional Skin Resurfacing & Tightening has excellent clinical data to support not only its remarkable results but also its safety profile.